The Scottish National Party (SNP) has secured 56 out of 59 Scottish seats in the General Election, elevating former leader Alex Salmond to Westminster and destroying the Labour Party’s share of the vote. Senior party figures, including Scottish Labour leader Jim Murphy and Shadow Foreign Secretary Douglas Alexander, were among those ejected from office, as well as prominent Liberal Democrats, including Treasury Secretary Danny Alexander and former party leader Charles Kennedy. The result represents the SNP’s biggest ever win, with the party taking all seven of Glasgow seats – including Glasgow North East by a record swing of 39.3 percent. The nationalists’ previous record was 11 seats in 1974. The SNP’s referendum-era leader Alex Salmond got the better of the Lib Dems in Gordon. He returns to Westminster for the first time since 2010. His victory address pulled no punches. “There's going to be a lion roaring tonight, a Scottish lion, and it's going to roar with a voice that no government of whatever political complexion is going to be able to ignore,” Salmond told Gordon constituents. SNP leader Nicola Sturgeon was lauded by many for building a dynamic campaign in the wake of a jolting defeat in the independence referendum last year. Arriving at the Glasgow count in the early hours of Friday, she said, “I am feeling absolutely fantastic. Among the most notable results was the election of 20-year-old SNP candidate Mhairi Black at the expense Douglas Alexander, who might otherwise have returned to the Commons as Labour’s foreign secretary. She will be the youngest MP elected to parliament in over 300 years. Her historic victory even won her a nod from Time magazine. Before taking her place in Westminster, the politics student must faces the daunting task of completing her final exams. 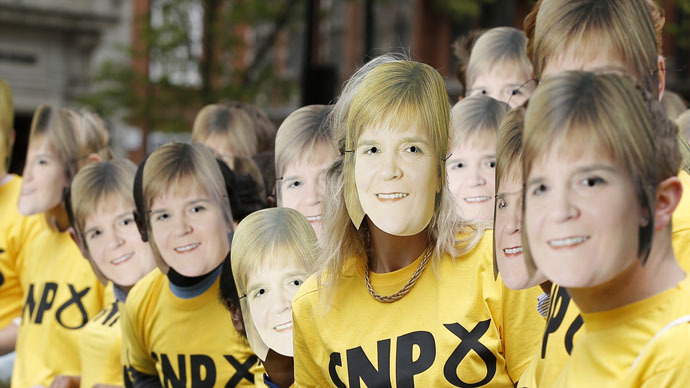 It didn’t all go the SNP’s way, however, despite early suggestions of a landslide victory. Much of the commentary by other parties had focused on the supposed threat of ‘nationalism’ rather than the SNP’s anti-austerity and anti-nuclear agenda. A careworn Labour leader Ed Miliband warned the next government would face the possible breakup of the United Kingdom. While Sturgeon did not address the question of a second independence referendum at length, suggesting she would only do so if the Scottish people called for one, social media is alive with precisely those calls. SNP say that a second referendum will only happen when the people of Scotland ask for it. I'm asking for it now. Congratulations to the SNP on a well deserved and majority vote. Can we just get a second referendum like now plz?